A set of 4 Battenberg lace machine embroidery designs. 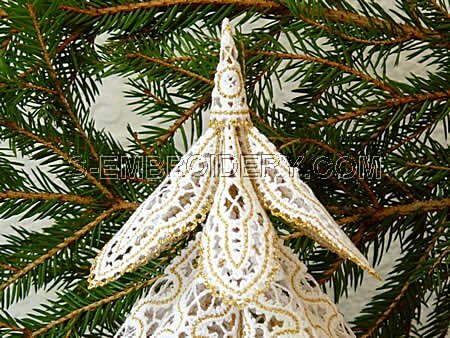 The set will produce a delicate lace Christmas tree. 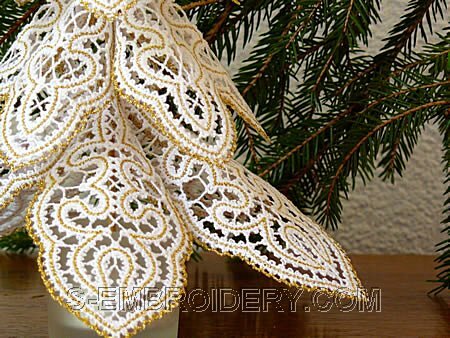 You receive 4 machine embroidery files in one of the supported formats as well as PDF files with design information and instructions for putting together the lace Christmas tree featured on our web site. 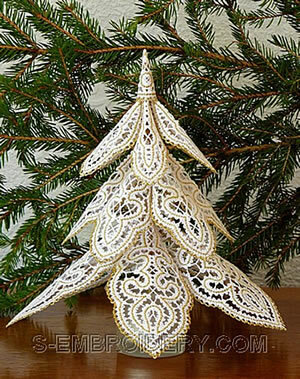 I bought the battenburg lace christmas tree pattern from you, which was quite expensive. I have tried stitching it, and am getting a bit fed up with wasting stabiliser, thread and of course time - every single time I have stitched it, the trim around the edge of the tree does not overlap the main body of the tree enough, and consequently, breaks away from the tree when I dissolve the stabiliser. Please can you advise how to stop this happening, or please refund me the amount I paid for it.